Question Are there associations between having or being denied an abortion with women’s mental health and well-being ? Findings This longitudinal cohort study observed 956 women semiannually for 5 years. Eight days after seeking an abortion, women who were denied an abortion reported significantly more anxiety symptoms and lower self-esteem and life satisfaction, but similar levels of depression, as women receiving abortions ; outcomes improved or remained steady over time. Meaning Abortion denial may be initially associated with psychological harm to women and findings do not support restricting abortion on the basis that abortion harms women’s mental health. Importance The idea that abortion leads to adverse psychological outcomes has been the basis for legislation mandating counseling before obtaining an abortion and other policies to restrict access to abortion. Objective To assess women’s psychological well-being 5 years after receiving or being denied an abortion. Design, Setting, and Participants This study presents data from the Turnaway Study, a prospective longitudinal study with a quasi-experimental design. Women were recruited from January 1, 2008, to December 31, 2010, from 30 abortion facilities in 21 states throughout the United States, interviewed via telephone 1 week after seeking an abortion, and then interviewed semiannually for 5 years, totaling 11 interview waves. Interviews were completed January 31, 2016. We examined the psychological trajectories of women who received abortions just under the facility’s gestational limit (near-limit group) and compared them with women who sought but were denied an abortion because they were just beyond the facility gestational limit (turnaway group, which includes the turnaway-birth and turnaway-no-birth groups). We used mixed effects linear and logistic regression analyses to assess whether psychological trajectories differed by study group. Main Outcomes and Measures We included 6 measures of mental health and well-being : 2 measures of depression and 2 measures of anxiety assessed using the Brief Symptom Inventory, as well as self-esteem, and life satisfaction. Results Of the 956 women (mean [SD] age, 24.9 [5.8] years) in the study, at 1 week after seeking an abortion, compared with the near-limit group, women denied an abortion reported more anxiety symptoms (turnaway-births, 0.57 ; 95% CI, 0.01 to 1.13 ; turnaway-no-births, 2.29 ; 95% CI, 1.39 to 3.18), lower self-esteem (turnaway-births, –0.33 ; 95% CI, –0.56 to –0.09 ; turnaway-no-births, –0.40 ; 95% CI, –0.78 to –0.02), lower life satisfaction (turnaway-births, –0.16 ; 95% CI, –0.38 to 0.06 ; turnaway-no-births, –0.41 ; 95% CI, –0.77 to –0.06), and similar levels of depression (turnaway-births, 0.13 ; 95% CI, –0.46 to 0.72 ; turnaway-no-births, 0.44 ; 95% CI, –0.50 to 1.39). 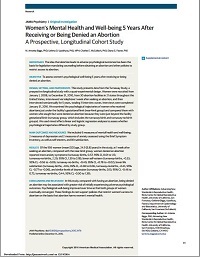 Conclusions and Relevance In this study, compared with having an abortion, being denied an abortion may be associated with greater risk of initially experiencing adverse psychological outcomes. Psychological well-being improved over time so that both groups of women eventually converged. These findings do not support policies that restrict women’s access to abortion on the basis that abortion harms women’s mental health.